One of the most intriguing features of Surrealism is that it plays havoc with time and place. The paintings of Leonora Carrington, who counted among the movement’s ranks before she died in 2011, could have been conceived in almost any historic moment and any locale inside or outside the imagination. Likewise, in her writings, Carrington’s evocations of madness, clarity of detail, and descriptions of internal terrors would be visceral no matter when or where they were read. Her writing, in modes that are fictional and confessional, is the stuff of psychology, mythology, fairy tales, nightmare, and religious fervor, and her presentation is at once brutal and matter-of-fact. It’s deadpan horror, you might say. Recently published by New York Review Books, a new edition of Carrington’s memoir Down Below opens with an elegant introduction by poet and critic Marina Warner, who offers an insightful investigation into Carrington’s “female madness” as well as her flashes of intellectual lucidity. We learn repeatedly how fuzzy the borders are between reality, unreality (dreams, fantasy, fiction), and art. The memoir itself begins in 1943, three years after Carrington was sent to a sanatorium in Spain. It was wartime, but Carrington seemed unconcerned with the actuality of the situation. Carrington deployed the Gothic-fantastic in her memoir and fiction in the same way as she did in her narrative paintings. Her short fiction in The Complete Stories of Leonora Carrington—collected by the Missouri-based publishing project Dorothy—is replete with absurdity and threat. In a tale titled “Uncle Sam Carrington,” she writes of an unusual scene: “The full moon shone brightly between the trees, so I was able to see, a few yards in front of me, the origins of a distressing noise. It was two cabbages having a terrible fight. They were tearing each other’s leaves off with such ferocity that soon there was nothing but torn leaves everywhere and no cabbages.” She marvels that, because she hadn’t gone to bed that night, it couldn’t have been a dream or a nightmare. Such logic—and illogic—pervades. Anthropomorphic visions and conversations assume their own reality throughout. Carrington lived in France, New York, and, ultimately, Mexico City, with which she is most closely associated. She attended boarding schools in England followed by a convent school, where the nuns couldn’t cope with her. As a student, she was rebellious and exceptional. “She could write with both hands and preferred to write with her left backward,” Warner notes. Finally, she was sent off to Italy, where she studied first in Florence and fell under the stylistic influence of the Sienese master painters, although her father disapproved of a career as an artist (if you went into art, he believed, “you were either poor or homosexual”). Carrington returned to England in 1936 and was subjected to the debutante scene at London’s Ritz Hotel, the site of some of her fiction. She then attended the art school founded by Amédée Ozenfant around the time when Surrealism was coming into fashion, although she had been long applying her imagination to canvas and had already met Max Ernst. He was married and 26 years her senior. She was 19. For a while, Carrington and Ernst took an apartment in Paris, before moving to Provence in 1937. A year later Ernst finally separated from his understandably resentful wife, and he and Carrington moved to a farmhouse near Saint-Martin where he sculpted bird- and fish-like gods and she made horse heads. But the surreal idyll came to a close in 1939, when Ernst was arrested after the French declared war on Germany. Carrington helped to get him released, but he was arrested again as an enemy alien. It was then that Carrington suffered a severe breakdown and was committed to a Spanish asylum. 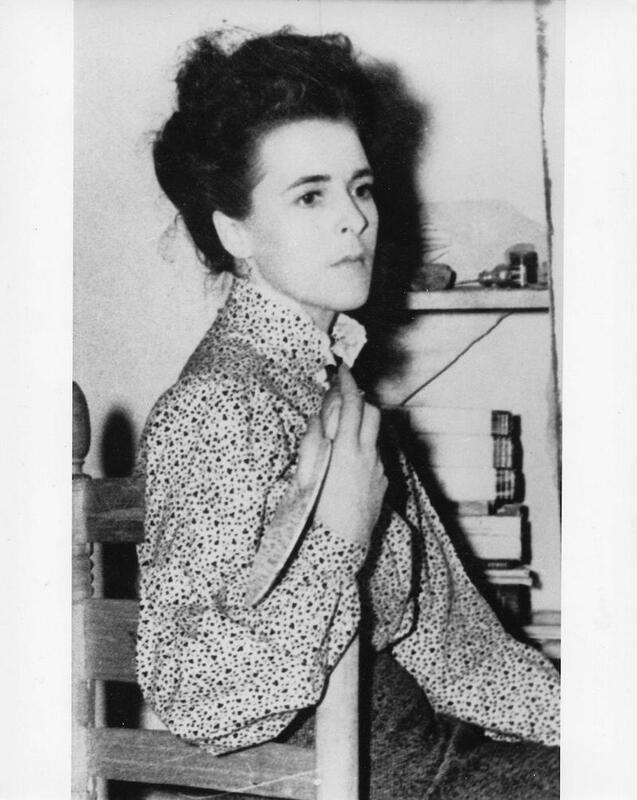 In Down Below, she writes of her terror during her confinement: “It was very clear I was possessed.” When she finally escaped the sanatorium, Ernst had taken up with Peggy Guggenheim, and Carrington went on to marry Renato Leduc, a Mexican diplomat, and then Emerico “Chiki” Weisz, a Hungarian photographer with whom she had two sons. But Ernst and Carrington continued to maintain their close bond. Reading the two new volumes, we come to realize that Carrington’s most compelling magic as a writer may lie more in her memoir than in her wild but less-nuanced stories. Down Below’s power lies in its peculiar, hyper-theatrical, and uncrafted frankness. The book’s best moments combine that with wild psychic imaginings and, at the same time, Carrington’s waltzes with her own reality—or, maybe more accurately, realities.